Companies face losing customers and revenue without them. According to new research commissioned by Ricoh, the number of 'intelligent workers' (iWorkers) in European businesses is expected to rise sharply over the next five years. It is estimated, currently, that four per cent of European business leaders would describe the majority of their staff as iWorkers: reliable and skilled employees who have 24/7 access to all the necessary information to meet the needs of the business and its clients. However, there is a strong view among business leaders that there will be a significant change over the next five years, with 37 per cent believing that by 2018 the majority of their workforce will be iWorkers. The study was conducted by Coleman Parkes Research and interviewed 735 senior business and IT decision makers from across Europe, including Ireland. It is believed that the acceleration of the iWorker may be connected to the growing consequences of ineffective information sharing. When asked to rank the areas that have been impacted the most, business leaders cited lost revenues in first place (49 per cent) followed by lost customers (43 per cent) in second and a lack of customer insight (27 per cent) in third. The study also highlighted the fact that there are challenges to overcome prior to increasing the presence of the iWorker in European businesses. While almost three quarters of company’s are investing in new technologies to improve employee productivity inside and outside of the office, the majority of decision makers emphasized the need to review existing processes so that employees can access business critical information more easily. Over 70 per cent believe the inability to access documents from a mobile device is holding their business back, while two-thirds say that inappropriate search functions are preventing or delaying employees from finding the information they need to help the business move forward. 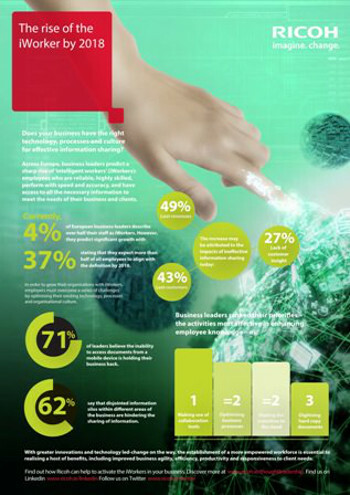 In addition 62 per cent say that disjointed information silos are hindering the sharing of information. 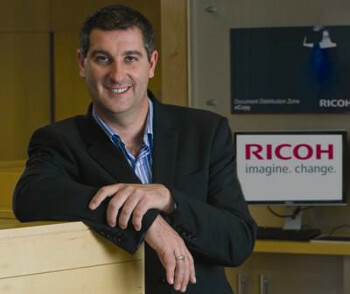 Chas Moloney, director, Ricoh UK and Ireland said, "The population of iWorkers is forecast to rise significantly. The question is, are businesses ready? Business leaders are more aware than ever before of the need to further optimise the way they use technology and eliminate the information silos occurring across the business. There is urgency to review and change traditional ways of working and keep up with technology-led change, which will continue to bring new challenges." Moloney added, "Now is the time for organisations across Europe to optimise critical business and document processes to prepare more effectively for the future. With greater innovations and technology led-change on the way, the establishment of the iWorker as a more informed workforce is essential to realising business growth, improved business agility, efficiency, productivity and responsiveness to client needs."